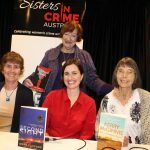 Almost 100 crime fans crammed into South Melbourne’s Rising Sun Hotel for Sisters in Crime’s Small Towns, Big Secrets, Criminal Intentions event on 20 July. The theme obviously struck a chord and writers Sue Williams, Kerry McGinnis and Aoife Clifford certainly knew how to play it. 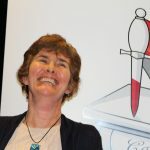 Under the gentle probing of compere and fellow author, Hazel Edwards, they simultaneously enlightened and entertained the assembled crime buffs who almost collapsed with laughter. Small towns or the bush are certainly the new scene of the crime in Australia. We only have to look to this year’s Davitt Awards where five out of six shortlisted adult novels are set in the country. The authors all had slightly different reasons for setting their books in the bush. 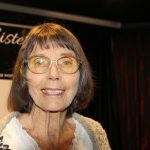 Sue Williams is the author of three crime capers set in Rusty Bore, population 147 – Murder with the Lot, Dead Men Don’t Order Flake and Live and Let Fry (Text Publishing) which all feature Cass Tuplin, proprietor of the Rusty Bore Takeaway (and unlicensed private investigator). Sue says: “When I was asked to write a few words about why I chose to set my books in a small country town, my first response was: pardon? Look, I’m just the biographer for Rusty Bore here; I didn’t exactly choose it. If I was making a conscious choice, I’d aim to write something hard-boiled and noir (although I’d be keen to set it somewhere glamorous – and I’d need frequent research trips, obviously). “Except. I do like to laugh. 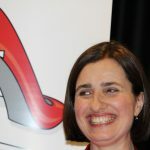 And I love laugh-out-loud funny books, which is not something we’re currently producing heaps of in Australia, especially not set in the country. We have a fine tradition of setting serious crime stories in country towns, where very, very nasty things happen. Often to young women. So someone had to write some books that give us a break from this Snowtown-Wake In Fright kind of world. Stories that show some of the lighter side of country life. All the way from Bundaberg (Queensland) was Kerry McGinnis whose latest outback mystery is The Heartwood Hotel (Penguin Random House). Kerry’s bestselling mysteries set in the Australian bush include The Waddi Tree, Wildhorse Creek, Mallee Sky, Tracking North, Out of Alice, and Secrets of the Springs. Kerry draws heavily on her own background. At the age of twelve she took up a life of droving with her father and four siblings. Kerry has worked as a shepherd, droving hand, gardener and stock-camp and station cook on the family property Bowthorn, north-west of Mt Isa. 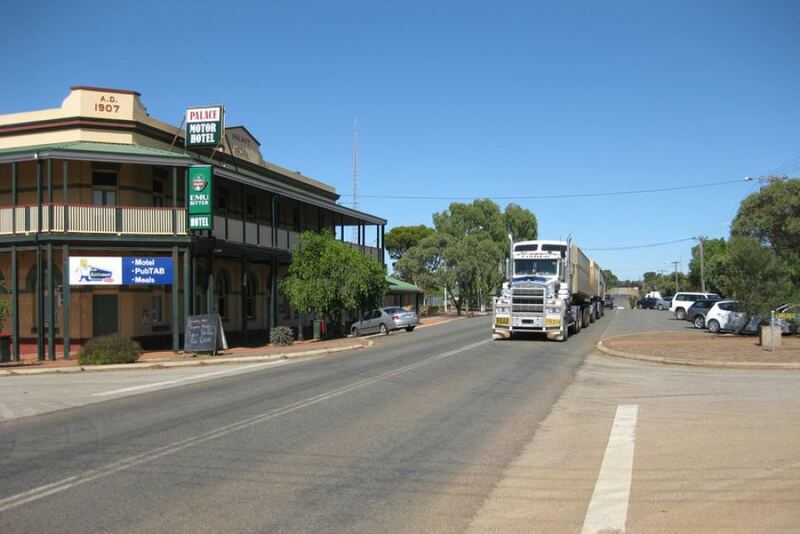 Tewinga, the town where The Heartwood Hotel is situated, has a population of seven. Rusty Bore is a metropolis, by comparison. Kerry says: “Because I only write outback novels and because there’s a limit to available scenarios on a station I have to keep coming up with new settings for my stories. They have to remain in the bush — I am an outback writer — and my protagonists need a reason for being there and a purpose in life. “No-one real is swanning around on permanent holiday — he or she needs a job that will keep them anchored in their setting. Stations are usually there in the background to provide the necessary community, and I’ve used them four times for a setting, but I’ve also had a tourist camp, a farmhouse (quite different, the way that country living is different to bush living) a bush pub as you’ve seen, and my next book will be set in and around a roadhouse on the Plenty River Highway in the N T.
“The swapping about of settings is also needed so that my protagonists can find work — governess, wife/mother, jillaroo, home help — what’s available is a bit limiting, no call for checkout chicks or hairdressers, lawyers or editors. The Heartwood Hotel gave me scope to introduce my minor characters as they came to the pub. It provided an occupation and a living for my protagonists, and the history of the area to root the place solidly in its fictional geography (never mind that most of its history is true.) Every bush district needs a centre, it’s usually the nearest small town, but a pub serves just as well if the town had already died. Aoife Clifford is the author of the best-selling crime novel All These Perfect Strangers and, most recently, Second Sight (Simon & Schuster), set in a small coastal town. “I grew up in a country town which is why I love writing about them,” Aoife says. “Crime in small towns works so well because everyone knows everything and everyone or they think they do. There is a limited number of suspects which allows the reader to play armchair detective and being closer to nature brings its own dramas. 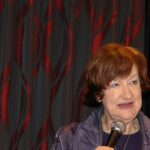 Compere Hazel Edwards is author of 200 books and most famously, for her classic children’s book, There’s a Hippopotamus on Our Roof Eating Cake. Last year she returned to crime with her adult murder mystery, Celebrant Sleuth (BookPOD), set in a country township during an economic downturn. According to Hazel, a country town enabled her to concentrate events and allow characters to meet in different roles, without it seeming coincidental. “I lived in a country general store as a teenager, so that was research, in hindsight. My asexual sleuth Quinn is a celebrant, but also in a long-term relationship with Art who runs the community media. So I needed her to be able to ‘bump into’ other regular characters in their neighbourhood, apart from her work performing ceremonies for marriages, funerals and naming days.